We can all agree that as humans we are deeply influenced by the people we share life with—our kin, our people, our community. Whether we like it or not, these relationships define so much about us as they influence our dreams, values, decisions and more. Your community and family extend past your blood relatives—they are a network of people who care for each other, cheering each other on in life. The way we see it, your community is your hand-picked family. This is the heart of our sponsorship program—relationships—a hand-picked family cheering on each other. This month, we have been looking at the ways in which sponsorship has shaped and molded our Sozo family—not only our kids, but also the families who have the privilege of supporting them. On October 1st, we began our “31 Days of Sponsorship” campaign with the goal of gaining 31 new sponsors this month! We believe sponsorship is an incredible way to love and support those across the globe whom you might not otherwise meet—getting to build new relationships and make an impact on another’s life. One thing we’ve found to be true is that often the impact goes both ways. This particular story highlights one of our sponsorship relationships and we hope through these words you will see the amazing way God goes before us to connect individuals in unique ways. Our first character in this narrative is Eddy, who became part of the Sozo family in 2011 with his brothers John and Solomon. Eddy is hardworking, artistic, joyful, and loves Jesus. You will almost always find him with a smile on his face. Early on, Aggie, our Child Development Director, noticed that Eddy excelled in hands-on projects like crafts and beading. Eddy decided that taking on a trade would be most appropriate for his future career. He developed an interest in fashion, specifically tailoring, and started taking classes to further cultivate his skillset. A couple years later, Kim Stockdale got involved with Sozo Children through her local church. Being a creative at heart, she wanted to contribute in a personal way, so she began sewing quilts for the Sozo bunks. These quilts were beautifully stitched with love, customized for each child. She had a gift. Kim and Eddy met on Kim’s second trip to Uganda in 2015. While their mutual love for sewing brought them together, it was their conversations that connected them on a deeper level. They would work together and talk for hours as they stitched. Building on the foundation from his classes, Eddy learned more about sewing and Kim’s eyes were opened to Eddy’s world perspective and heart. 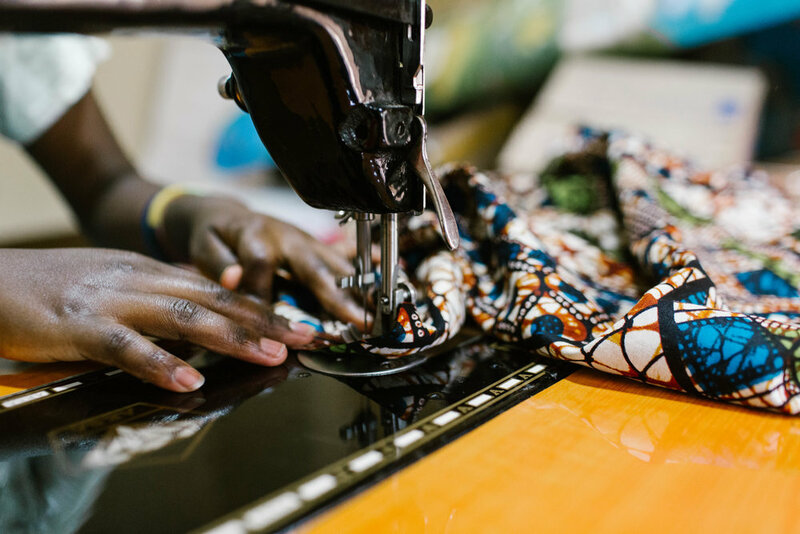 “While sewing for me is therapeutic and a way to create things, Eddy has shown me that sewing is a way to connect with people on a deeper level and share God's love. We take what gifts God has given us and find ways to glorify Him and build relationships. When I talked with Eddy, I saw hope, perseverance, and love on a whole new level—a joy that overcomes all trials,” said Kim. They both made a huge impact on each other. After returning from her trip, Kim’s family was able to start sponsoring Eddy. He had stolen her heart with his passion for people, eagerness to learn, and his desire to spread the gospel through artistry. Through Sozo’s sponsorship program, they are able to write letters, video chat and visit. Supporting others selflessly looks like wanting the best for them and being willing to encourage them towards that goal. We are confident that these two will always be encouragers—a hand-picked family to each other. Eddy has since started his apprenticeship with a local tailoring company serving boutiques in Kampala to create colorful African clothes. It is beautiful how the Lord orchestrates these divine relationships, weaving common passions—like sewing—into our lives to connect us to others. Community is important and receiving people who lift you up—who support and love you unconditionally is a sweet gift from the Father. Sponsorship is so much more than a monthly payment, it is a powerful relationship—a second family across the globe that is cheering you on—your own Ugandan kin.